Blue Bell. PA - - MarketVision Research and Dr. Joel Schindler have published an article in Marketing Health Services, an American Marketing Association publication. Rising Oncology Medication Costs and the Impact on Patients focuses on the medical and societal implications of rising oncological medication costs and is based on recent research with patients. To download a PDF file of the article click here. Ronald McDonald House Charities - The mission of RMHC is to create, find and support programs that directly improve the health and wellbeing of children and families. RMHC is the catalyst to create a world where children have access to quality health care and their families are able to better comfort and support them while actively participating in their care. MarketVision is proud to support RHMC and our volunteers regularly donate their time and compassion to their local chapters. 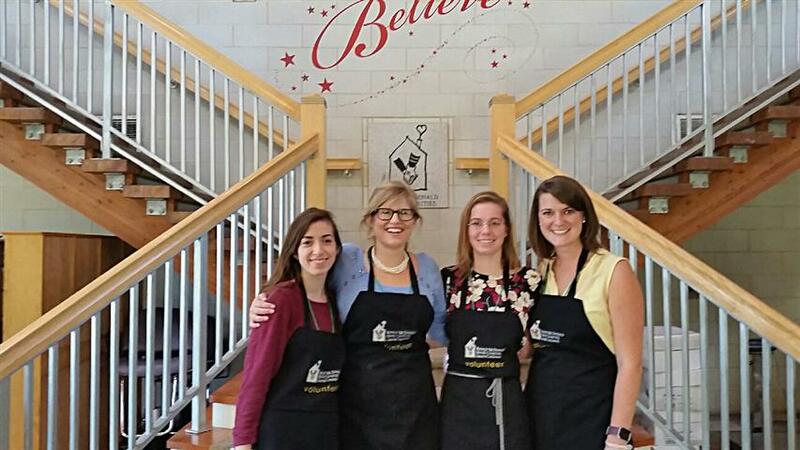 Pictured here are volunteers from our Cincinnati office who last month helped create lunches for some of the children. From left to right: Adina Gegprifti, Nicole Schoenberger, Morgan Beagle, and Lanie Ross. Thank you to all our team members who contribute their time to make the world a better place. Blue Bell. PA - - MarketVision Research has been selected to participate in a poster session at the PMRG Institute 2016 October 24th in Cherry Hill, NJ. MarketVision’s Tom Donnelly will be participating in the PMRG Institute with PMRG Health Literacy collaborators from other companies to share highlights from research. The goal of this initiative is to raise awareness to the fact that health literacy varies greatly and can affect patient compliance. Hannah McIntosh joins the firm as Research Assistant in our Marketing Research Online Communities team. She has a Bachelor degree in Business Management from Northern Kentucky University. Morgan Beagle joins the firm as Research Assistant in our Quantitative Client Service team. She has a Bachelor degree in Marketing and Business Analytics from Miami University. Tayler Fisher joins the firm as Research Assistant in our Quantitative Client Service team. She has a Bachelor degree in Marketing from Indiana University. Alexandra Shultz joins the firm as Research Assistant in our Pharmaceutical Qualitative Research team. She has a Bachelor degree in Communications and Journalism from Miami University. Adina Gegprifti has joined the firm as Research Assistant in our Quantitative Client Service team. She has a Bachelor degree in Psychology and Chemistry from Miami University. Laurie Sites has joined the firm as Research Assistant in our Quantitative Client Service team. She has a Bachelor degree in Marketing from Indiana University. Douglas Flournoy has joined the firm as Research Associate in our Graphic Design team. He has an applied science degree in design/ computer graphics, design/print and packaging from AIC College of Design. Douglas joins the team after several years in retail design and identity development designer experience. Chela Jones has joined the firm as Research Associate in our Qualitative Field services team. Chela holds a Bachelor of Arts in Communication from Temple University. Chela joins the team with over 8 years of marketing research experience. Claudia Almanza has joined the firm as Research Associate in our Graphic Design team. Claudia holds an associate’s degree in graphic design from Cincinnati State Technical and Community College. Claudia joins the team after several years of interactive graphic designer experience.